Hello everyone! It's my turn to post over at Twine It Up! with Trendy Twine. 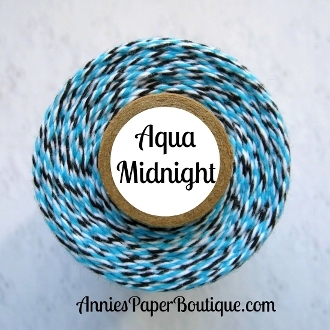 Today I have a card to show you featuring the fabulous Aqua Midnight Trendy Twine. Our theme this month has been summer nights. Well, when I was young, I loved to sit out and look at the stars and make wishes on them. I don't do that as much anymore because down here in the south, I get eaten alive by mosquitoes! For my card, I cut out the star shapes from MFT dies. Then I glued my Aqua Midnight Trendy Twine onto the stars. It did overlap a bit, but I like the look. This was a bit detailed to do, but I had purchased a quilling glue bottle with a very fine tip and it worked beautifully! I added my wish stamp (also MFT Stamps) and some silver star sequins. A wonderful card! Perfect for the theme and I love the way you used the Trendy Twine! Fabulous card, love the way you added the twine stars! Thanks for the tip on the a quilling glue bottle, I'm always doing twine outlining and may have to pick up one of those! Such a pretty card!! I love the trendy twine stars!! This is such a GREAT card Helen! LOVE those stars!! !